The average climate in the world is gradually changing due to the increasing amount of pollution and increasing greenhouse gas emissions. In fact, scientists warn that the climate of the world is changing due to those factors, especially the rising emissions of greenhouse gas, which might result warming the planet by more than two degrees. There are some conspicuous numbers showing the effects of climate change in Asia and the Pacific. Asia is actually a key in this climate change phenomenon. According to study, there is around 35% of the total percentage of energy related carbon dioxide emissions worldwide that comes from the developing Asia. This is way too high as compared to the 17% of the year 1990. There is 70% of the total percentage of the emissions in the region from the People’s Republic of China. However, the per capita emission of the country is only around 50% of the average of the developed world. 2030 is the year anticipated when the developing share of Asia within worldwide energy related emissions can reach just about 45%. This is already the expected percentage even without greater utilization of advanced energy efficiency and renewable energy. This idea alone is already frightening thinking. The increasing incidents of climate change may bring a number of impacts to the region. There is an estimated study telling that 7 out of 10 countries at the highest risk of natural disasters and climate change worldwide are within Asia and the Pacific, while three of those countries minute Pacific island states. In year 2050, 20 million is the estimated number of Bangladeshis to be displaced by the one meter increased in sea level. There is more than 60% of the total population of the region working within forestry, agriculture and fisheries. These are the sectors greatly at risk to developing climate change. By the year 2025, ranging from 300 million up to 410 million is the estimated rise of Asian urban occupant who will be at risk of flooding in the coast. In the cases of inland, the quantity of occupants at risk will increase ranging from 245 million up to 341 million in the same estimated year. In addition to the risks faced by many people because of climate change in Asia and the Pacific, there is also the need to increase and improve the disaster risk management. 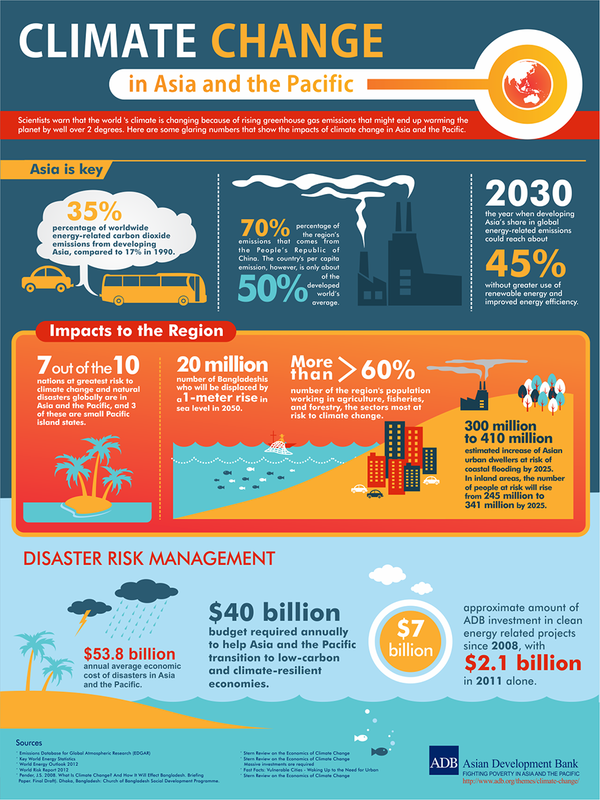 There is more or less $53.8 billion annual economic cost average of disasters in Asia and the Pacific. The annual budget required in order to help the people affected by climate change in Asia and the Pacific change to climate-resilient and low-carbon economies. This is quite a tough battle to be worked on together by people worldwide. ADB is one of concerned organization in preventing the boost of climate change, enabling them to spend much budget for it. In fact, there is an approximate amount of $7 billion that is invested by ADB in clean energy relevant projects ever since 2008, having $2.1 billion during the year 2011 alone. Not only major organizations can help in such prevention but even the simplest individual worldwide. Everyone can be affected by this phenomenon so everyone must also consider helping to prevent it.